Alnilam or Epsilon Orionis is a blue star. The central belt star of Orion is the most distant, but brightest of the three. It is at the end of its existance as a main sequence star and will soon evolve to a red supergiant. Then it will outshine Betelgeuse. To the left is Alnilam. Right below it and next to the Horsehead Nebula is Alnitak. 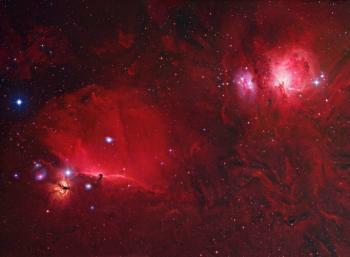 In the upper right ist the Orion Nebula.